Also in the reference manager I was unable to find a fitting assembly. Am I doing something wrong or this is an error in the documentation and none of these classes are available for Windows 10? 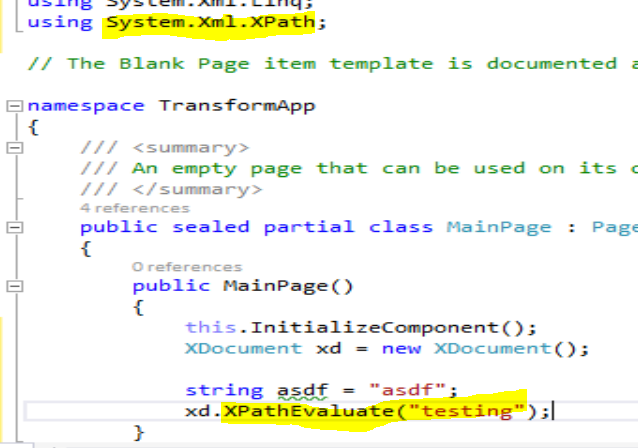 So, it turned out that you have to add the System.Xml.XPath.XDocument Package with Nuget. It is a bit unfortunate that this is so undocumented on MSDN. This will also allow for XPathSelectElement (not depicted, but working in my environment). Not the answer you're looking for? Browse other questions tagged c# .net xml xpath uwp or ask your own question. How to use XPath with XElement or LINQ? Where is the NuGet package for Microsoft.WindowsAzure.ServiceRuntime? How to package a portable .NET library targeting .NET Core? How to package a .NET library targeting .NET Framework and Universal Windows Platform and include platform-specific functionality?